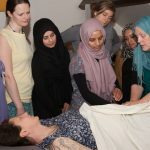 Mizan Practitioner Training is a practical hands-on course. Prepare yourself for a week of massaging and being massaged! You will feel very nurtured and will leave feeling refreshed and renewed. I believe that to heal others you need first to heal yourself and the course facilitates a lot of self-healing.